Last week on the evening of Wednesday, July 27 a fiery object blazed a trail across the sky and was visible from Los Angeles to Las Vegas to Sacramento, perhaps even as far east as Colorado. If you were even paying casual attention to the news on Thursday you already know it wasn't a meteorite, a bird, or a plane, but was a Chinese rocket fragment re-entering the atmosphere after its June 25 launch. The spectacular event inspired many questions. Why did it take a full month for the rocket booster to come down? Why was it glowing so brightly? Was anyone in danger, and where did it land? How much space junk is up there, anyway? There are perhaps half a million objects from paint flakes to satellites to defunct rocket boosters out there. The fact is, in this modern era there’s a large amount of stuff orbiting the Earth. There are perhaps half a million objects from paint flakes to satellites to defunct rocket boosters out there — 20,000 of which are larger than a softball and are tracked by the Department of Defense. Their location spans from low-Earth-orbit (in the 200-300 mile range) out to the geosynchronous satellite distance of 26,000 miles, and somewhat beyond. All that material is stuff we put there since the beginning of the Space Age in 1957. Before that the skies were pretty clean. In the case of last week's re-entry event, following the June 25 launch of a Chang Zheng-7 rocket, its second stage (shown in the picture below between the lower first stage and booster rockets, and the third stage on top) fell into a low-Earth-orbit, and has spent the last month circling the Earth in the thin upper reaches of our atmosphere. In that time, the stage's orbital speed has been constantly slowing due to air drag, forcing it to descend gradually. In the final throes of its decaying orbit, the rocket stage descended deep enough into the thickening atmosphere (perhaps in the 50-mile altitude range) for the high-speed friction to cause a burn-up. Astronauts returning to Earth endure the same forces during re-entry, but their spacecraft are equipped with heat shields and stabilization systems to prevent incineration. Which begs the question of how often this happens since we certainly don't hear about it in the news every day. Something the size of the Chang Zheng-7 second stage, which is about the size of a school bus, re-enters perhaps once each year. Most of the time these objects go unnoticed, at least by large numbers of eye witnesses. 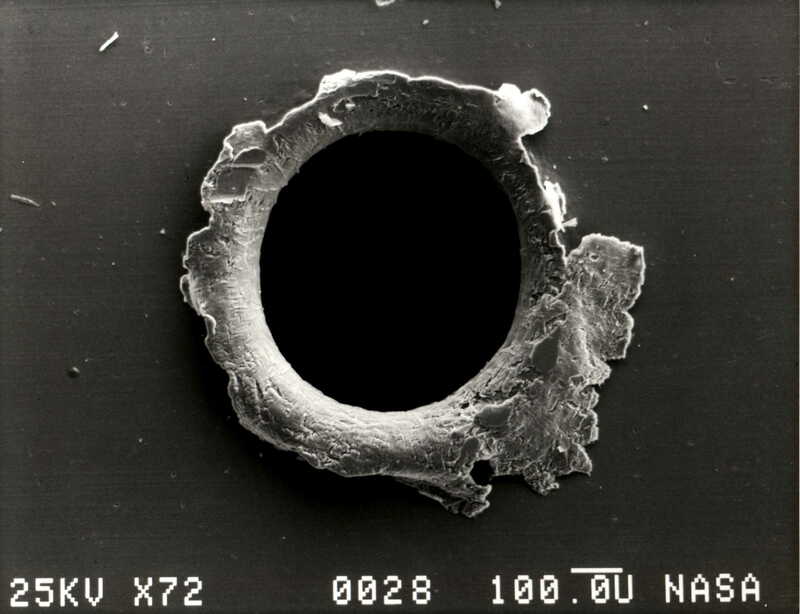 And the space debris usually break-ups or vaporizes in the atmosphere with only a few smaller pieces reaching the surface. Since 75 percent of the Earth's surface is ocean, it's more likely that a junk-fall will strike water, not land -- and a considerable portion of dry land is sparsely populated at best. It is said that what goes up must come down. Though this is not absolutely true (after all, we've sent plenty of robotic probes through the solar system that aren't coming back), this can be said of most Earth-orbiting satellites. The question is, when will they come down? The answer depends on how high their orbits are. Objects in low-Earth-orbit must move at thousands of miles per hour just to remain aloft, but the constant drag of Earth's thin upper atmosphere continually slows stuff down, causing orbits to decay. Even the International Space Station, 200 miles up and traveling at 17,500 miles per hour, would gradually spiral downward if it were not given a rocket-assisted boost periodically. 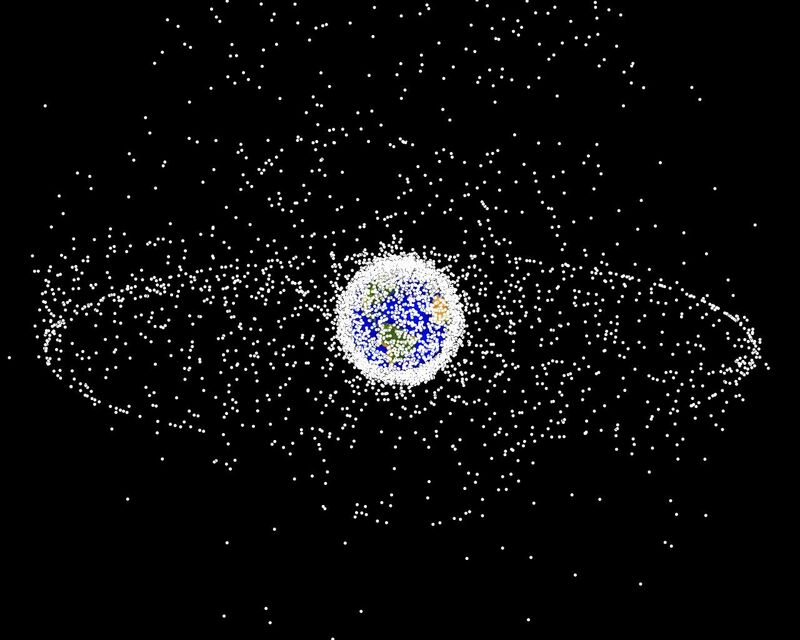 Satellites and bits of space "junk" orbiting at greater distances can stay up there much longer. One of the earliest artificial satellites ever placed in orbit around Earth, the United States' Vanguard 1 in 1958, is still up there almost six decades after its launch, ranging between 400 and 2,400 miles out. The most distant satellites could remain in orbit for thousands of years, or more, and may still be circling long after their makers are gone. To those of us on the ground, most of the half-million pieces of space junk buzzing around the Earth are not a concern, for even when they do re-enter the atmosphere, most of them are small enough to completely burn up before reaching the ground, with a few notable exceptions like Skylab and the Mir space station. For most of this space debris, especially those objects whizzing around in lower orbits, the safety concern relates to satellites, spacecraft, the International Space Station. Even something the size and mass of a flake of paint, traveling at speeds of tens of thousands of miles per hour, can cause considerable impact damage. On at least one occasion, the crew of the International Space Station were instructed to board the Soyuz spacecraft for quick evacuation in case a piece of tracked orbital debris collided with the station. The very real danger of orbital collisions with space debris has compelled the space programs of the U.S. and other agencies to design satellites with a "safe self-destruction" capability -- for example, the ability to de-orbit in a safe and controlled manner at the end of their functional missions, or to be placed in a safe "graveyard" orbit far from Earth. 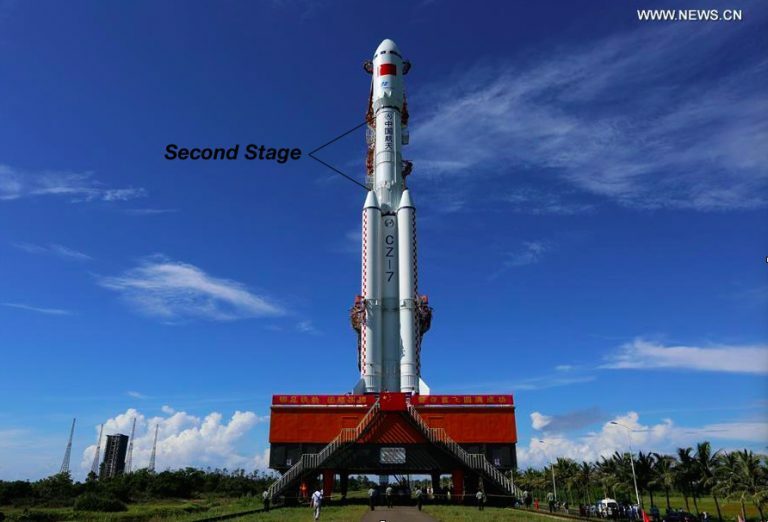 So, where did last week's Chang Zheng-7 rocket stage, or any debris that didn't burn up, make planet-fall? As of this time, no damage or injury has been reported, so hopefully the spectacle of this re-entry was all in its fiery sky show.